Paul David Tripp’s book has been titled incorrectly. Dangerous Calling should be titled, Lessons in the Woodshed. The author guides pastors to the woodshed again and again and again. While this is clearly not the most glowing and winsome way to begin a book review, readers will see firsthand that the author is committed to telling pastors the truth and leading them out of the desert of sin and into the high places of victory. Finally, Tripp warns pastors of the danger of “arrival.” He confronts the propensity of pastors who falsely assume that they have nothing more to learn, what he refers to as “self-glory.” His challenge is bold and timely: “You and I must not become pastors who are all too aware of our positions. We must not give way to protecting and polishing our power and prominence. We must resist feeling privileged, special, or in a different category. We must not think of ourselves as deserving or entitled. We must not demand to be treated differently or put on some ministry pedestal. We must not minister from above but from alongside.” Challenges and admonition like this appear throughout the book; challenges that call pastors to be servant leaders. Each page is filled with sobering challenges for men who call themselves a pastor/shepherd/elder. Indeed, there are many “lessons in the woodshed” but the author does not leave pastors in a hopeless condition. Rather, he applies the gospel to pastors who have been wounded in light of unconfessed sin, pride, and arrogance. I believe that Paul David Tripp has accurately accessed the condition of pastoral ministry. But the assessment is not the most important observation. What stands at the center of this discussion is the gospel. Pastors must return again and again to the gospel. It is true that pastors must deliver the message of the gospel from the pulpit each week. But pastors must also preach the gospel to themselves. They must see themselves as recipients of grace; sinners in need of grace; sinners in need of forgiveness. May God raise up a new generation of pastors who are humble, contrite, and tremble at God’s Word (Isa. 66:2b). In his excellent piece, 21 Maxims for Discouraged Pastors, Douglas Wilson reminds us that discouragement is part and parcel of pastoral ministry. Here is a piece of advice for men in pastoral ministry. Whenever you face the fires of adversity, unjust criticism, or swim in the sea of discouragement – pick up something by Charles Haddon Spurgeon. The Full Harvest: Volume 2 is no exception to this rule. The second volume of C.H. Spurgeon’s autobiography chronicles his life and ministry from 1860-1892. This account is a revised edition which was originally compiled by the British pastor’s wife, Susannah and Joseph Harrald. This volume contains the high’s and low’s of Spurgeon’s ministry and demonstrates that Spurgeon was no stranger to controversy and adversity. Here is a man who battled a myriad of maladies and was plagued by chronic depression. The book shows how the Prince of Preachers overcame these barriers and trusted in his Savior to carry him through. Perhaps the most impressive feature is Spurgeon’s resilient mindset. He endured many hardships in his London pastorate. Yet his influence remains with us today – with thousands of sermons for us read and digest. I have my own private opinion that there is no such thing as preaching Christ and Him crucified unless we preach what nowadays is called Calvinism. It is a nickname to call it Calvinism; Calvinism is the gospel, and nothing else. I do not believe we can preach the gospel, if we do not preach justification by faith, without works; nor unless we preach the sovereignty of God in His dispensation of grace; nor unless we exalt the electing, unchangeable, eternal, immutable, conquering love of Jehovah; nor do I think we can preach the gospel, unless we base it upon the special and particular redemption of His elect and chosen people which Christ wrought out upon the cross; nor can I comprehend a gospel which lets saints fall away after they are called, and suffers the children of God to be burned in the fires of damnation after having once believed in Jesus. Such a gospel I abhor. Spurgeon’s rock-solid belief in the doctrines of grace is a testimony to the power of the gospel and the joyful journey which is promised to God’s elect. Living by Revealed Truth: The Life and Pastoral Theology of Charles Haddon Spurgeon by Tom Nettles is a magnum opus if I ever saw one. The subtitle nicely summarizes the path that is set before readers as they study the rich biography of the Prince of Preachers and gain insight into the theological landscape that dominated his ministry for almost 40 years. Eighteen marvelous chapters are packed into this book of nearly 700 pages. Over the next several days, I intend to present the high points, noting the strengths of the book and any criticisms that may arise. One thing is sure: Spurgeon was a towering figure in 19th century England and he continues to wield a mighty influence on preachers in the 21st century. His influence on this preacher has been inestimable. His integrity, passion for truth, love of evangelism, and heart for people is a mighty boon for the soul. I’m looking forward to the journey! 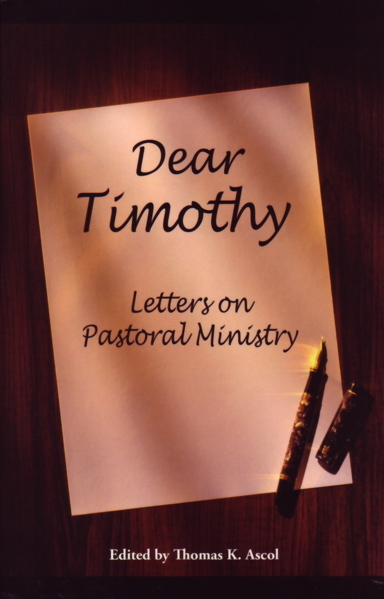 Dear Timothy: Letters on Pastoral Ministry, edited by Tom Ascol includes twenty mock letters to a new pastor. Each letter is meant to inspire, educate, motivate, and admonish. Letters are written by seasoned pastors who have “run the bases” of pastoral ministry multiple times. Topics include matters of character, theological conviction, preaching, evangelism, worship, training, discipleship, among other things. While Dear Timothy is geared to rookie pastors, it is sure to encourage experienced pastors as well. This is a tremendous resource that should be reviewed consistently. The advice is timeless. Pastors will only be strengthened and edified by reading this work.